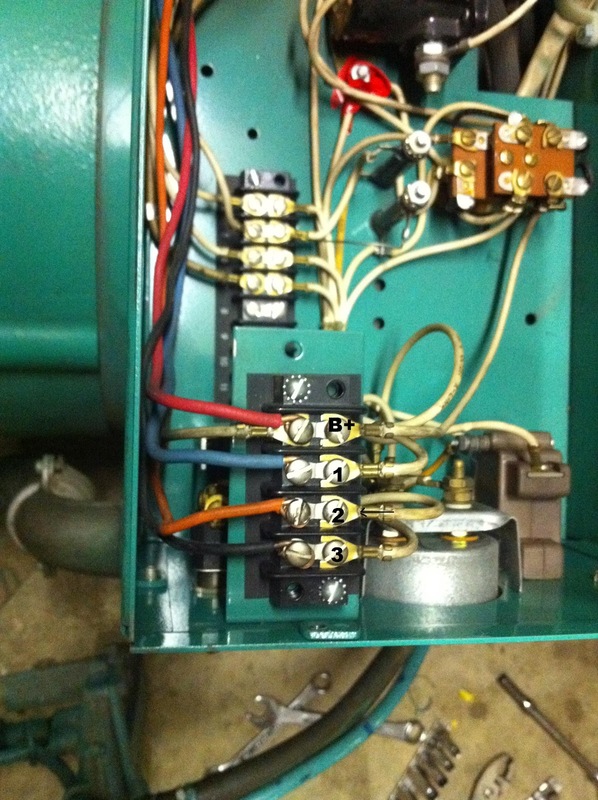 For most units I need to start the engine from the unit instead of the transfer switch. Some have a Auto-Off-Manual switch on the front of the unit. 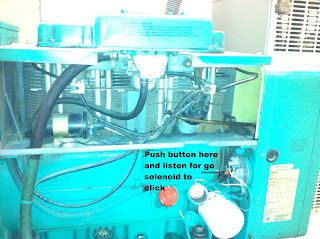 If there is no switch you will need to open the lower control panel cover and either flip the switch that is inside (if there is one) or pull off wire #2 on the terminal strip. When the unit fails to start put your meter on the battery to check your cranking voltage. A cranking voltage of about 9.6 vdc is considered okay. Pull off a spark plug wire and pop it onto an old spark plug (or screwdriver if you dont have one) and hold it to a known ground to check for spark. If there is no spark use your meter to check for B+ at the coil while cranking. This photo shows where to put your meter to read full battery voltage. You can also check the resistance of the spark plug wire from your coil to the distributor to make sure it isn't a damaged wire which is common. If you suspect that the coil has failed you can check the specs for what the primary and secondary resistance should be and check it with your meter. Like in the video you can check that your points are making contact. If they are they may just need to be cleaned. Take a clean piece of white paper and fold it a couple times and swipe it between the breaker points. 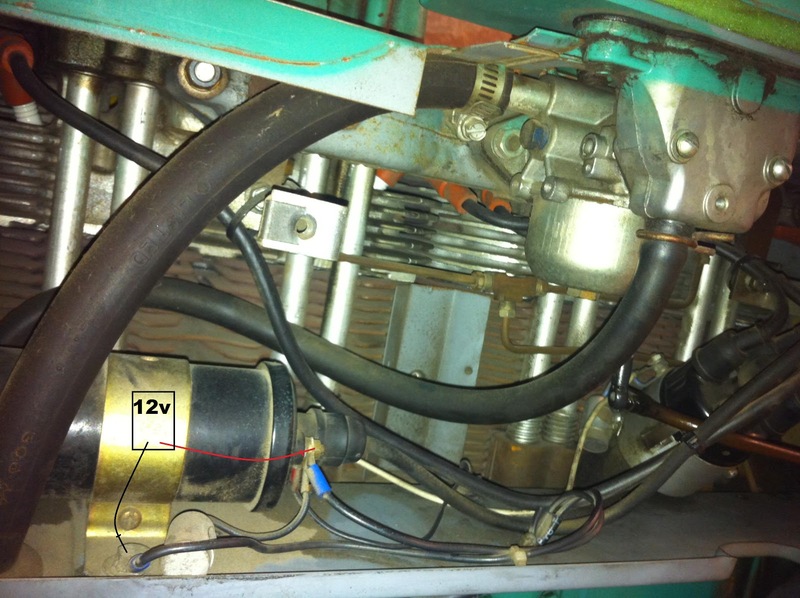 On some Onan units the other small wire on the coil should read half battery voltage while it is cranking and if you are reading full battery voltage your breaker points are not making contact and you need to re-adjust the gap. Setting the gap of the points varies for each model so you will need to look up the procedure in a manual if possible. I will try to make a posting in the future with the proper procedure for different models as they are always quite old and the manuals are kind of difficult to obtain. Inside the cover shown in this picture you can find a little push button and when you push it you should hear your "Go" solenoid click. Also check how dirty the rotor contacts are, how worn your spark plugs are, and make sure all plug wires are on tight. This is where I start from and if this all fails phone calls are made. Hopefully this makes sense and there may be a part 2 in the future with more tips. **Note: Onanism is apparently the art of masturbation named after the god Onan. This post is about generators and not touching yourself so please keep that in mind before attempting these procedures!